Gone are the days when being a “smart parent” just meant making sure you always had a spare set of baby clothes and a plentiful supply of diapers in your changing bag. Today, being “smart” comes down to the products you use in your home to save you time and energy and, most important, keep the little person in your life safe. The smartest baby products out there? They’re the ones that let you keep an eye on your tot from anywhere, give you peace of mind (by monitoring their breathing, temperature and movement), and even soothe them to sleep — so you don’t have to. 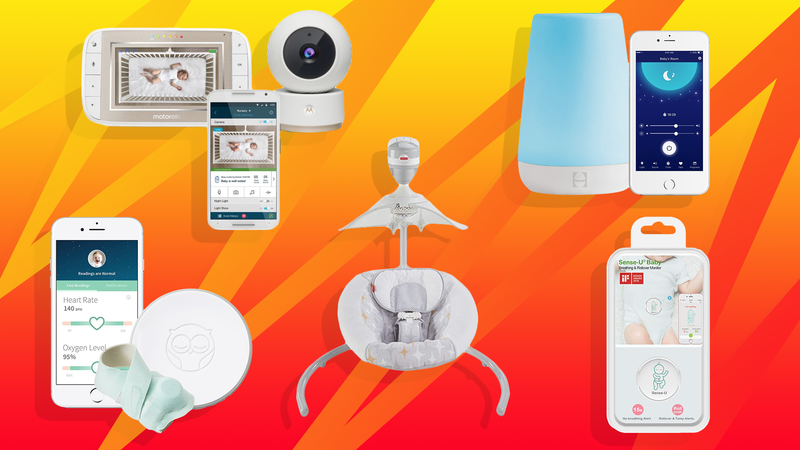 Here are the best “smart” baby gadgets on the market that are sure to make parenting (a little) easier. 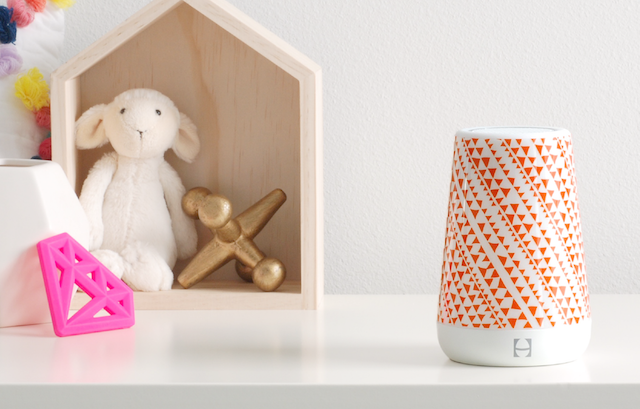 It can also play white noise or soothing sounds, and if you’re the sort to match your baby gadgets to your nursery decor, prepare to get excited. You can choose from a range of stylish coverlets to let you coordinate to your heart’s content. But what’s most impressive about Rest is that you can control it from afar whenever your schedules or plans change — for example, if you need to give your baby more time to fall asleep. Let’s be honest — the one thing guaranteed to throw a baby off their napping game is their parent entering the room. Or simply hovering outside the door of the nursery. There’s not much the Fisher-Price Starlight Revolve Swing doesn’t do. It swings, it moves in circles, it plays music, it spins stars, and it puts on a light show. It’s basically a multilayer entertainment system for your kiddo to enjoy from the comfort of a cozy plush seat pad. With six swing speeds and 16 songs, you can (hopefully) find the magic combination to soothe your baby, and you can control it all from your smart device thanks to the fancy Smart Connect technology. Remember the bouncy chair of old — a piece of fabric stretched over some wire? Yeah, you don’t want that. You want this. At some point, you’re going to have to stop watching your baby sleep and get on with other stuff. The Motorola Halo is the next best thing to actually standing beside them, 24-7. It’s a baby monitor that attaches to any cot or crib and provides a “parent’s-eye view” of your little one thanks to the 1080p camera and audio and motion sensors. It’s also detachable and portable, so you can use it anywhere in your home, and has infrared night vision for round-the-clock surveillance. The Halo feeds audio and video to a connected home viewer, or you can hook it up to your smartphone using the Hubble app. 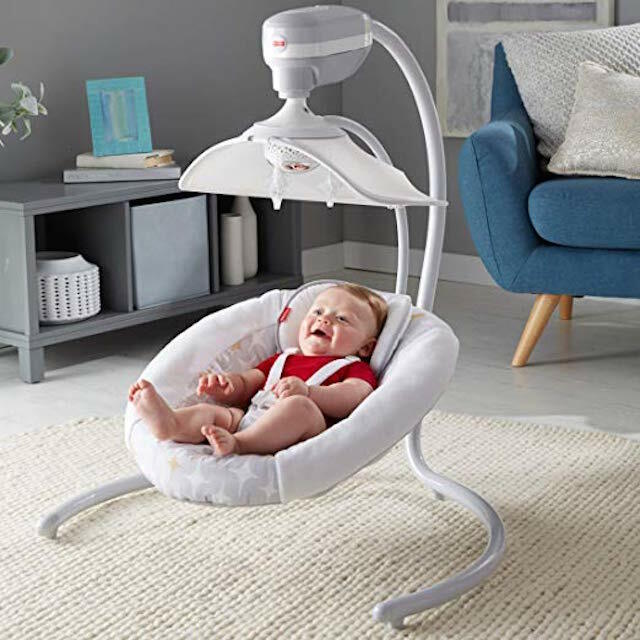 Plus, it has night-light and light-show options and a built-in speaker to play soothing sounds, including white noise and nature sounds, for your tot. Not all smart baby monitors are big and bulky. The award-winning Owlet is the size of a sock, and like a sock, it wraps around your little one’s foot. Compatible with iOS and Android devices, it monitors your baby’s heart rate and oxygen levels, sends real-time insights to your device and alerts you when there’s cause for concern (when values are outside preset limits.) Baby’s safety and well-being during sleep is one of the biggest worries for parents, but this clever little gadget gives real peace of mind. 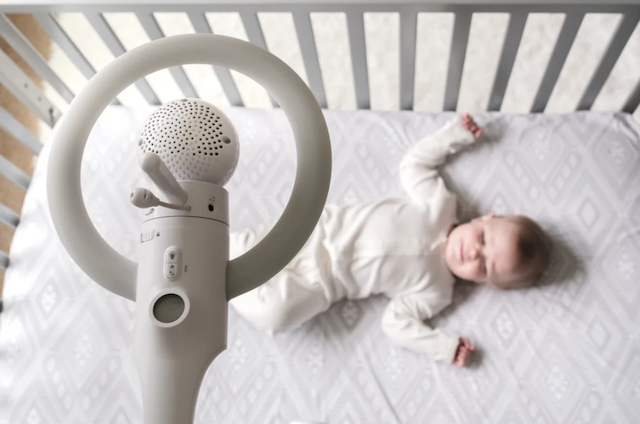 The Owlet also works as a stand-alone monitor — it comes with a base station, which glows green to let you know your baby is OK — making it perfect if you have to leave your baby in the care of a grandparent or babysitter. Another smart baby product designed to give parents a better night’s sleep is the Sense-U Breathing & Rollover baby movement monitor. 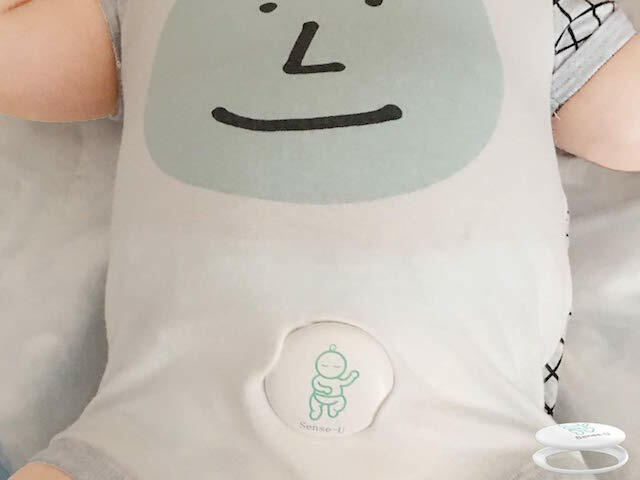 Measuring only 1.6 inches, it attaches to any material no thicker than a quarter, like a swaddle or onesie, and monitors your baby’s breathing and movements and the humidity and temperature of the surrounding environment. It works with both iOS and Android, sending alerts via an app on your device if your tot stops breathing, is sleeping on their stomach or is getting too hot or too cold. You can turn each of the four alerts (breathing, rollover, temperature and humidity) on or off individually to suit your child’s age and stage. For example, you could turn off the rollover alert when your child reaches the toddler stage, when rolling over is inevitable. Until someone invents a diaper-changing robot (it’s only a matter of time, surely), these smart baby products are among the best. Let’s embrace anything that helps to soothe baby and maximize sleep for worn-out parents.